CNC TURNING CENTERS HAVE LIVE TOOLING. THIS ENABLES US TO DO ALL MILLING, DRILLING AND TAPPING OF HOLES IN ONE OPERATION. WE CAN INDEX AND ORIENTATE AT ANY ANGLE FOR MAXIMUM ACCURACY ON YOUR PART. ALL THIS IS DONE ON MACHINING CENTER AUTOMATICALLY WITH NO HANDLING. YOUR PARTS COME OUT COMPLETE TO PRINT. 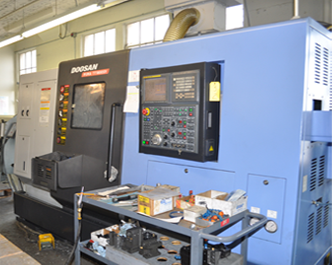 1 DOOSAN LYNX 220LM HIGH PERFORMANCE TURNING CENTER 3 AXIS WITH BAR FEEDER. 1 OKUMA LB300 2 3/4" DIA. THRU SPINDLE 10" CHUCK AND PARTS CATCHER. MAXIMUM TURNING DIA. 14 1/2". 1 OKUMA CAPTAIN-L370M MULTIFUNCTION TURNING CENTER 2 3/4" DIA. THRU SPINDLE 10" CHUCK AND PARTS CATCHER. MILLING AND DRILLING. LIVE TOOLING. HIGH PRODUCTION TWIN TURRET MILL/DRILL LATHE WITH 2 OPPOSED SPINDLES DIA. THRU SPINDLE WITH A LNS BAR FEED 2-5/8 SYSTEM. HIGH PERFORMANCE TURNING CENTER 4 AXIS 2 WITH BAR FEEDERS. COMPLETE MULTITASKING WITH Y-AXIS FUNCTIONS ONE CHUCK MACHINING EVEN WITH IRREGULARLY SHAPED WORK PIECES.